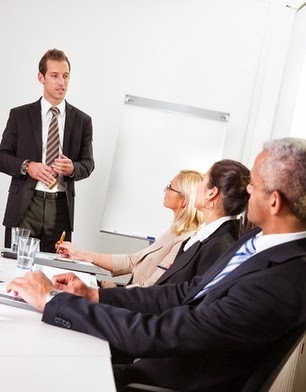 As a business leader, making effective presentations is a requisite skill. Winning new clients often requires making a persuasive presentation. You may find yourself making a presentation to the public to gain their support for your project. You make internal presentations to train, inform, or influence employees. Perhaps you speak at conferences and workshops to build your reputation as a thought leader in your industry. Given the importance attached to the presentations we make, I marvel at the haphazard way many of them are put together. The process often starts with creating PowerPoint slides without a clear vision of what it is we're trying to communicate. Our presentations often lack any evident structure, reflecting the stream-of-consciousness manner in which they were prepared. Define. The first step is to establish what you want your presentation to accomplish. In other words, what specific impact do you want it to have on your audience? How do you want them to respond? Don't settle for a simplistic, generic objective like: "We want them to award us the contract." Sure, that's the outcome you'd like. But what is your presentation's role in making that happen? What do you need to convince them of? What do you need to clarify? In what way do you need to change their thinking? Of course, to answer these questions, you'd need to know something about your audience. That's where presentations often go astray first—failing to understand what the audience wants, needs, or is interested in. So planning an effective presentation starts with learning all you can about the people you're presenting to. Design. With your purpose identified, now you want to determine what key messages need to be clearly communicated to achieve that purpose. Typically, I would suggest no more than 3-5 key messages. These are specific points you want your audience to understand and remember. They deserve special attention in the context of your presentation. In fact, your presentation should be built around these few key messages. One of the best ways to distill the essence of your presentation and identify your key messages is to do what I call the "Two-Minute Drill." This involves imagining you only had two minutes to do your presentation and planning it accordingly. What results will likely reveal the main points you need to build your actual presentation around. Call to Attention—Open your presentation by giving your audience a compelling reason to really tune in to what you have to say. Key Messages—These constitute the high points in your presentation, the few things that are important to take away from what you have to say. Supporting Points—What you need to say to illustrate and validate your key messages. Call to Action—A strong close that is designed to influence your audience to respond in a certain way. Develop. Now that you have the structure of your presentation, it's time to build out it's content. As noted earlier, many start the presentation planning here, creating slides or pulling slides together from prior presentations. Collecting content before your outline is completed is okay as long as it's exploratory, like doing research for a term paper. But beware of locking into content choices before you've gone through the process of defining your purpose, key messages, and presentation structure. I encourage you to design your Call to Action first, since it's last in your presentation and more likely to be remembered (assuming it's memorable!). The result of your Two-Minute Drill is a good place to start. Plan on two minutes for your Call to Action. Write it down and memorize it so you can deliver it convincingly. Next move to your Call to Attention. Have something really interesting—even provocative—to open your presentation with. Your audience wants to know "What's in it for me?" So it's important to connect with their interests or needs at the outset. Give them good reason to pay attention to your presentation while their attention level is normally at its highest. Your key messages are anchor points in your presentation. They should provide the high marks in the contours of your talk. You want to avoid the common "flat presentation" where all content is seemingly treated as equally important (or worst yet, equally unimportant to your audience). In organizing your content, list supporting points for each key message. Order these by importance. I suggest assigning your supporting points to one of three categories: (1) what you must say, (2) what you should say, and (3) what you might say. Usually, you will have more things to say than time to say them, so organizing content from most to less important can be helpful in deciding what to retain. Be judicious about keeping anything that falls under "what you might say." Deliver. Your planning and preparation should put you in position to deliver an effective presentation. Most presenters I've observed in our business spend too little time getting ready. It shows. There are a few natural speakers out there who can wing it and be pretty effective, but most of us require a good amount of upfront work to be competent at it. You should strive to come across as authentic and confident as possible. When I coach presenters, I want to see comfort before polish. I don't want to encourage people to essentially recite a script, trying to get all the words right. I want them to look natural and comfortable. That's more persuasive than perfection. You want to engage your audience interpersonally. That means relating to and involving them, speaking with them instead of at them. Plan what questions you will ask to encourage audience participation in your topic. Take an informal poll: "How many of you..." Above all, you want to convey that you care about your audience. You want to show your passion for your subject. How many dry presentations have you sat through where the speaker didn't look particularly excited about the topic—and neither did the audience? I've sat through my share. Passion is contagious, and persuasive. That's one reason you need to get comfortable with your presentation, because it's hard to convey passion when you're uptight. You want to practice until it feels natural. How much practice will depend on the individual and the situation. Of course, how you feel is less important than how it looks like you feel to the audience. If it's an important presentation, get some feedback from a colleague or friend. Even better: Videotape yourself; that's probably the harshest critic you'll face.